Hilltop Craft House, although not quite finished, was in use when John Challis visited in July. It has been established by Ruth Nyondo just outside Mzuzu with support and funds from and through the Raven Trust. Here Ruth brings together local women and trains them in all sorts of craft and machine skills in order that they can help and support each other and gain skills with which they may be able to generate income for their families. The women make clothes for their children or can sell the articles. It is hoped to open a shop on the site where the completed crafts can be sold to provide some income for materials and overheads. 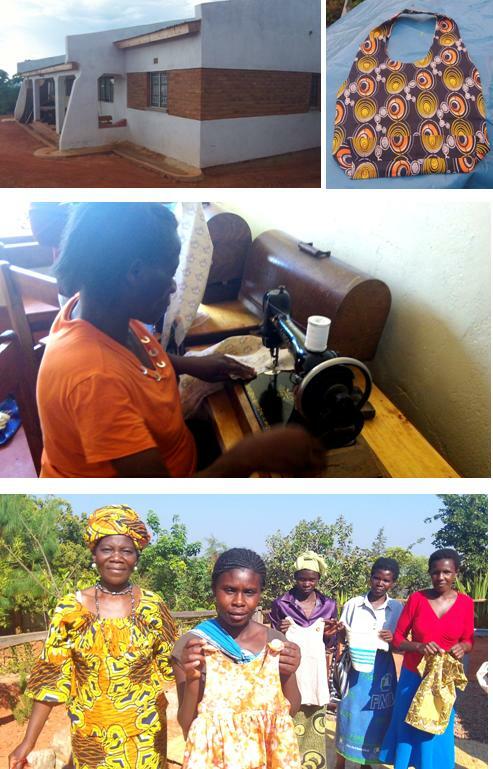 The picture top right is a sample of the bags which some of the women make for sale. The Raven Trust has also sent sewing machines, knitting machines and boxes of fabrics, wool, knitting needles and sewing equipment to Hilltop Craft Centre in its containers.